Seattle Mag Get’s Down w/ the Bedazzler! 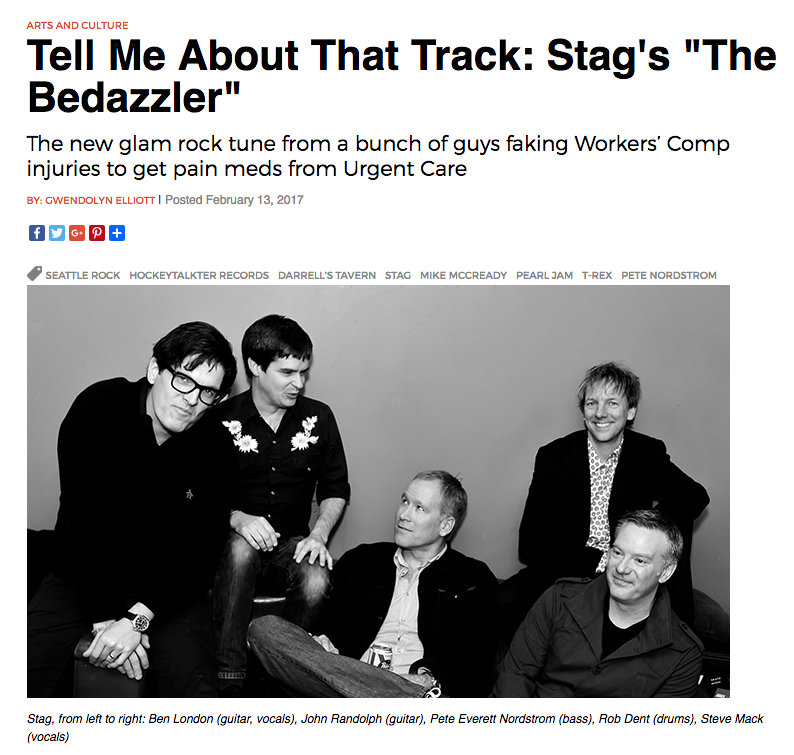 In this edition of Tell Me About That Track, we catch up with Ben London of five-piece rock outfit STAG, a group currently promoting its latest 7-inch single, the T-Rex-indebted “The Bedazzler,” through Mike McCready’s HockeyTalkter Records (find it via Pearl Jam’s site here). You can hear them play it live this Friday at Darrell’s Tavern 7th anniversary party. In three sentences or more, tell us the story of the band: This is the true story…of seven strangers…picked to live in a house…and have their lives taped…to find out what happens…when people stop being polite…and start getting real…The Real World. Sorry, that’s the Real World. As for STAG, we’ve all known each other for years, decided to form a band that was based on the scientific question, “What would a can of Rainier sound like plugged into a Marshall Stack?” and have lived with the consequences ever since. 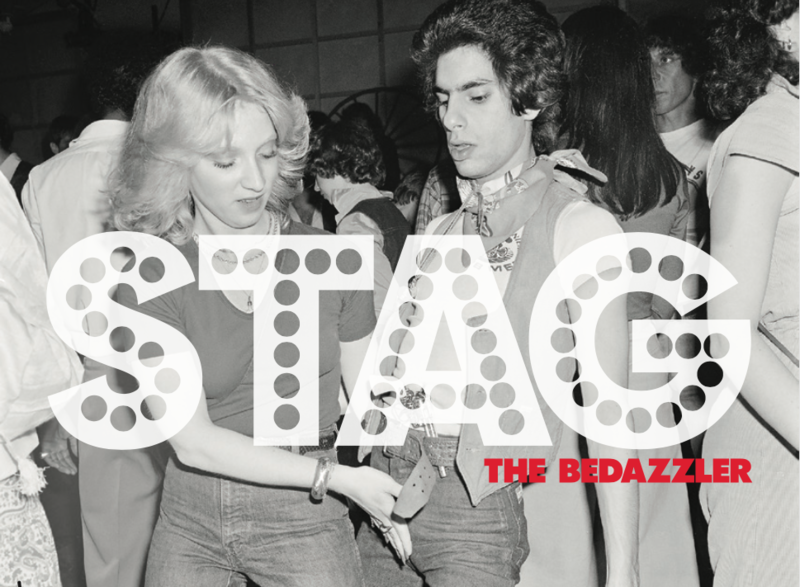 In three sentences or more, tell us the story of the track: The Bedazzler started out of a joke-filled conversation I had with our bass player Pete about the old commercials for “the BeDazzler.” I’m a big ’70s glam fan and started joking around like I was T-Rex’s Marc Bolan saying “I’m the Bedazzler” while doing wizard hand moves. That punch line stuck with me and I sat down a few days later and wrote the song. They lyrics practically wrote themselves. Once we started working it out as a band it got larger and more epic at every turn. Add some horns, some Gary Glitter-esque “Heys!” and a few guitar solos, what do you get? The Bedazzler! What’s next? We’re headed out to New York City in early February to make a record with one of our favorite producers John Agnello (Dinosaur Jr., Hold Steady, Sonic Youth, Buffalo Tom). We’ll be producing the 2nd Annual Summer Stag Party Aug 5th at Slim’s (that in 2016 featured Big Star’s Jody Stephens), and playing some other shows here and there. For 2017, it’s basically just keeping the pedal to the metal and faking Workers’ Comp injuries to get pain meds from Urgent Care. We have a single release show on February 17th as part of the celebration for Darrell’s Tavern’s 7th anniversary. The Bedazzler is a Time Machine! Released on Pearl Jam guitar player Mike McCready’s HockeyTalkter Records. The latest recording from Seattle Power Pop purveyors Stag is a full-on chooglin’ slice of stomp-worthy boogie evoking early ’70s glam. Let’s just say Marc Bolan would be proud. A limited edition colored vinyl 45, featuring iconic cover imagery from famed NYC ’70s-era photographer Meryl Meisler, is a rager!. 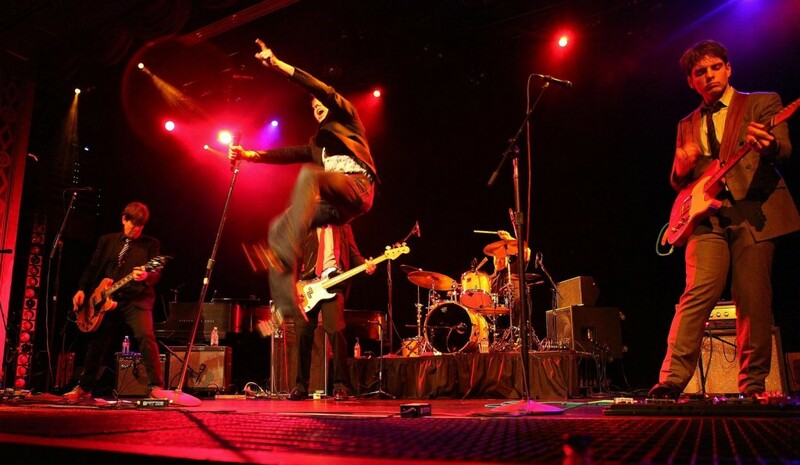 Recorded by Jack Endino and mixed by Martin Feveyear, the single captures the members of Stag laying down their most ambitious songwriting, and production to date. “The Bedazzler” burns hot live and will sound perfect mixed in with artists like T- Rex, Ty Segall or Eagles of Death Metal on any radio station or playlist. Hear it now in all its glory! Debuted yesterday on Seattle Radio Station KEXP, the Bedazzler is ready for action! Some footage from after our Full Length CD came out. On Friday, December 7, a diverse lineup of local rock acts will bring their combined talents to the Triple Door for the first annual SMooCH (Seattle Musicians for Children’s Hospital) Show. Brad (Stone Gossard , Shawn Smith), Chris Friel Orchestra with special guests Pete Droge and Carrie Akre, Stag, The Young Evils, The Sangster Family Band and Rachel Flotard will all donate performances to raise funds for Seattle Children’s at an evening concert and auction.